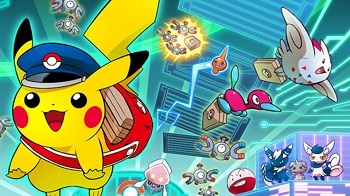 Similar to the real world Pokemon Center stores located in Japan, a digital counterpart has gone live for the United States, offering similar Pokemon-themed products. Today marks the launch of the Pokemon Center, a web-based store for Pokemon fans in the United States. The store experienced a limited launch on July 2nd, and now has a wide variety of physical merchandise available for purchase and delivery. Items for sale include various Pokemon plushies, themed T-shirts, mugs, and even Pokemon Trading Card Game booster packs. To celebrate their grand opening, a special commemorative collection featuring note cards, binders, notebooks, collectable pins and more are available- branded with Special Delivery Pikachu and other PokÃ©mon. In honor of the PokÃ©mon Center launch, a special PokÃ© Ball Pattern Vivillon is available for free in North America for owners of Pokemon X and Pokemon Y until August 12th. The event Pokemon is a level 12 and knows the following moves: Stun Spore, Gust, Light Screen and Struggle Bug. In order to receive the Vivillon, first make sure your Nintendo 3DS is connected to the Internet. Select "Mystery Gift" on the main menu, then choose "Receive Gift". After choosing "Yes", select "Get Via Internet", then "Yes" again. You should be able to see the Pokemon being transferred on screen to your system. Once in game, speak to the delivery girl in any PokÃ©mon Center to have the Vivillon placed in your party. As always, save your game after this transaction so as not to loose the Pokemon after shutting off your 3DS. See anything in the store that catches your eye? Let us know in the comments!